Today we did not have any lessons as we were visiting another school. 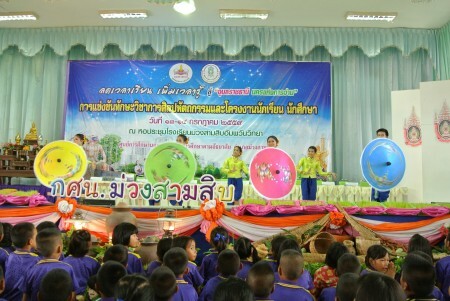 Another school in Muang Samsip was holding a singing and dancing competition and a small fair with market and food stalls. 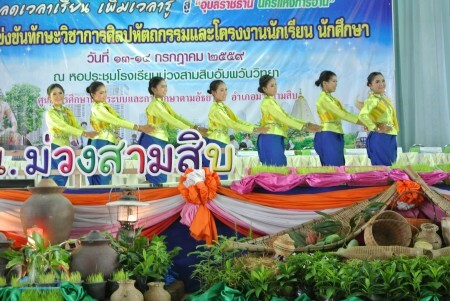 After sitting through the opening ceremony, where they held a signing for an educational act, we watched some traditional Thai dancers from Ban Pintho School and were introduced as Scandinavian teachers. I’m not entirely sure why, it could just be that we were so pale that we didn’t look British! After the ceremony we had some more photos. I had better have my photo face sorted by the end of this placement! Then we went and explored the market. 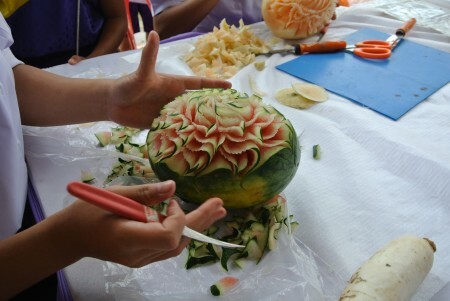 Some students were fruit carving which looked so good that it would be a crime to eat it. 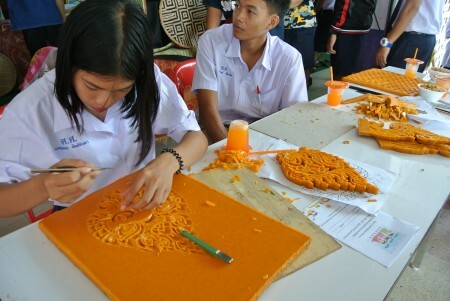 There were also some students carving candle wax into ornate decorations. This was amazing to see, especially as there is the Candle Festival next week, where they make giant 3D statues and parade floats out of candle wax. So this was a brilliant taster and it was great to see the students doing it too. It was really hot at the school, so we stayed for a little while wandering around before heading back to the school around lunch time. There was little else to do at school apart from sitting in the staff room and plan for English club and lessons tomorrow – the dog Bop Bet wasn’t even there to play with! 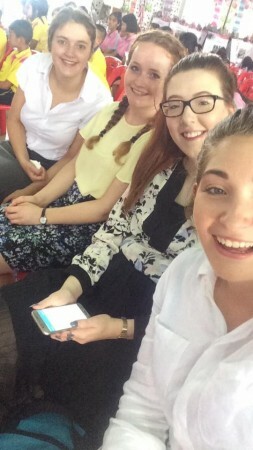 As much as Hannah and I planned out English Club (Eilidh and Kate were at English activity), we couldn’t actually force the students to turn up. After a long day at the rice fields the G.7-9s were obviously knackered and didn’t want to stay for an extra hour – even if we were just doing games! The G.10-12s, however, I don’t have an excuse for! We still went to the classroom and played hangman whilst it was tipping it down with rain outside. Eilidh and Kate then joined us after English Activity. They had some students there, but also made their own things. They made a sheep and a crocodile out of lolly pop sticks. At least they’ll make their desks look nicer! We then played charades until it was 4pm and officially they end of English Club that week.